Generation Rent? - What is it and how has this happened? Generation Rent is the term used to define a particular demographic in our society that, due to high house prices and rents, are unable to save for their first home. They are those who are currently trapped in the Private Rented Market, struggling to save for their first deposit due to relinquishing a large proportion of their income on rent each month. 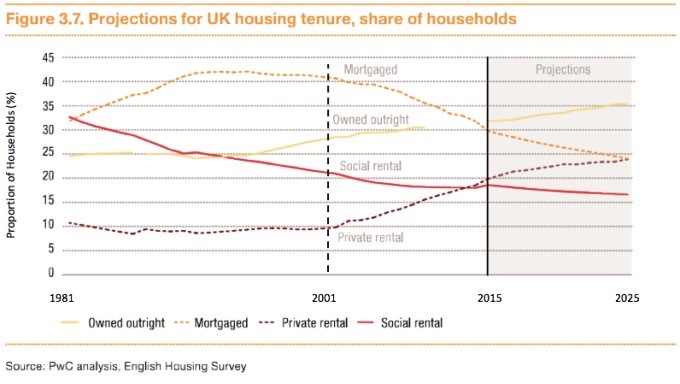 Since 2001 the amount of households in the Private Rented Sector has more than doubled, whilst home ownership has reduced. This was when the rise of Generation Rent began, as illustrated in the table below. But what are the reasons for the Rise of Generation Rent? One of the main reasons is that we are not building enough homes in the UK and have not been doing so since the 1970's. This has created a backlog of under-delivery in a country with a rising population. Simple economics dictates that if demand is greater than supply, prices will rise and that isexactly what has happened (amongst other complex factors, such as greater availability of finance). The below table demonstrates how many homes we have been building since the 1970's in the UK. Another scary observation from the above graph is that social and affordable housing delivery has reduced significantly over the decades which has caused a multitude of problems such as a ballooning welfare bill and a rise in homelessness. The majority of homeless people come from the Private Rented Sector as there is not enough Social housing for them and they get priced out and have to live on the streets. One of the key reasons for the reduction of house building since the 1970's is because the Public Sector stopped building homes, hoping that the Private Sector would step up to fill the gap - well that was a mistake... It turns out that the Private Sector would prefer to control supply in order to maintain higher sale prices. They are incentivised not to drastically increase their output. The effect of a lack of supply has boosted house prices - this was great for those who already own but bad for those who don't as house prices have risen much faster than inflation and wages, which means that most homes are now out of reach for first time buyers. The below illustration shows the price of daily goods today if they rose by the same amount as house prices. It frustrates me when existing home owners say that in the UK we are obsessed with owning our homes. I disagree, we are not obsessed but are aware that financial security in the UK is tied to owning a home as. If salary inflation was in line with house price growth then renting would not be so bad. Yea, I may be exaggerating but it makes the point that in order to millennials to save for their first home they will have to sacrifice a few years. All generations had to do that right? But are we sacrificing more and for longer than past generations? Other alternatives available to Generation Rent are to make the most of the affordable and intermediate housing products on the market. Many of which are not actually affordable... This will be summarised in a future blog and has been covered brilliantly in the Priced Out report by IPPR. What did I do? My partner and I bought house boat in London in order to escape the Private Rented Market. A bit excessive, yea, but damn it was fun. I also set up RenKap - A PropTech company helping Housing Associations, Local Authorities and SME's to scale their delivery of affordable homes on small sites. Our aim is to provide Local Homes for Local People. By definition, if Local People can't afford it, then it's unaffordable. Stay tuned for more housing news and insights.